2007 Sea Ray 38 Sundancer Stock# 2473 2007 Sea-Ray 380 Sun-Dancer w/ Twin Mercruiser 8.1L. MORE INFO AND PICTURES TO COME SOON! Boat has black hull sides with white arch. Raymarine 12"MFD with open array radar. Seller is very motivated!! 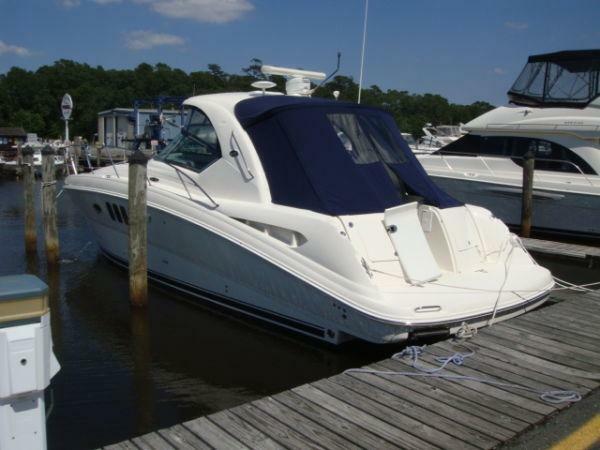 2007 Sea Ray 38 Sundancer The cleanest 2007 38 Sundancer on the market ! 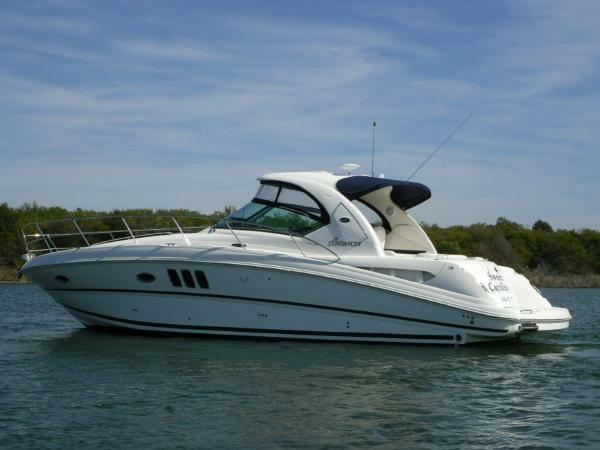 Equipped with a bow thruster and ONE OF A FEW '07 38 DA'S W/OPTIONAL 8.1L HO'S(420 hp). ONLY +/-250 HRS. ! Give us a call OR EMAIL US for further details. COME TAKE A LOOK, YOU WILL NOT BE DISAPPOINTED ! 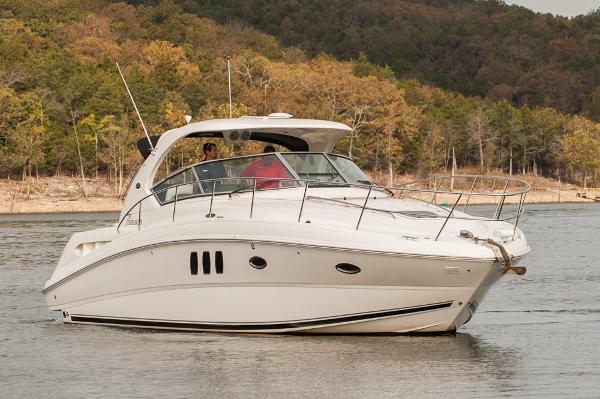 2007 Sea Ray 38 Sundancer This exciting 38 Sundancer features a stylish fiberglass hardtop with aft sunshade, overhead lighting and stainless-steel grab rails. An innovative center door in the transom provides easy access to the luxuriously appointed cockpit, complete with Corian table top, wet bar and icemaker. Powered by twin 8.1 S Horizon MerCruiser V-drives, this robust Sport yacht offers a four-year limited engine warranty, underwater exhaust, and standard anchor washdown. 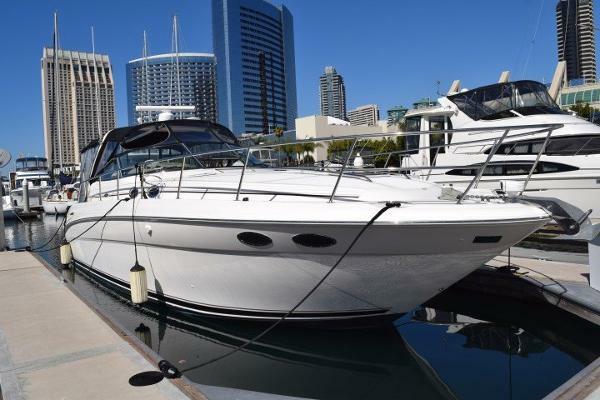 2006 Sea Ray 38 Sundancer 2006 Sea Ray 380 Sun Dancer loaded and in absolute excellent condition. Less than 300 hours on the motors and generator. This boat is a FRESHWATER only boat. This boat won't last long. Boat is ready for you. Contact us for more details. 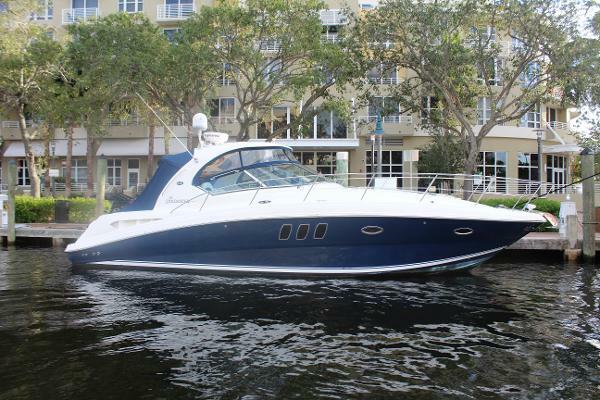 2001 Sea Ray 38 Sundancer This 2001 Sea Ray 38 Sundancer has low hours and a motivated seller that is ready to move up to a larger boat. 2006 Sea Ray 38 Sundancer We just took this in on Trade and someone's going to get a steal of a deal. Trackvision , Radar, GPS, Fish Finder, Cockpit TV, twin 8.1 Mercruiser horizon that run like new. 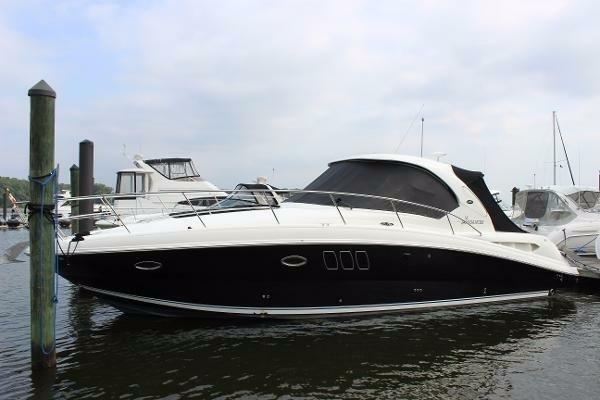 2006 Sea Ray 38 Sundancer The exciting 38 Sundance features a stylish fiberglass hardtop with aft sunshade, overhead lighting and stainless steel grab rails. An innovative center door in the transom provides easy access to the luxuriously appointed cockpit, complete with Corian table top, wet bar and icemaker. Powered by twin 8.1 S Horizon Mercruiser V-drives, this robust Sport Yacht offers a two-year limited engine warranty, underwater exhaust and standard anchor washdown. 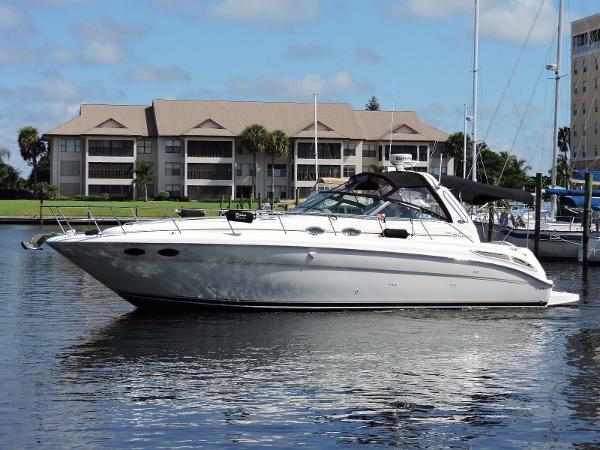 2008 Sea Ray 38 Sundancer This exciting 2008 Sea Ray 38 Sundancer features a stylish fiberglass hardtop with aft sunshade, overhead lighting and stainless-steel grab rails. An innovative center door in the transom provides easy access to the luxuriously appointed cockpit, complete with Corian table top, wet bar and icemaker. A great sport yacht with features normally found on boats much larger in size. . The Sundancers wide-open cockpit with centerline walk-through passage provides face seating for several people. The interior layout floors with style and luxury. A folding pedestal master berth, with private access to split head facilities located within the port side A full stand up shower compliment the interior within the starboard side compartment. The deli area includes a freezer, refrigerator, microwave, sink and the two burner stove. Impeccable wood grain cabinetry along with beautiful countertops. The cabin area also a large seating area with an oval wood table. An additional sleeping area with TV to complete this cabin. 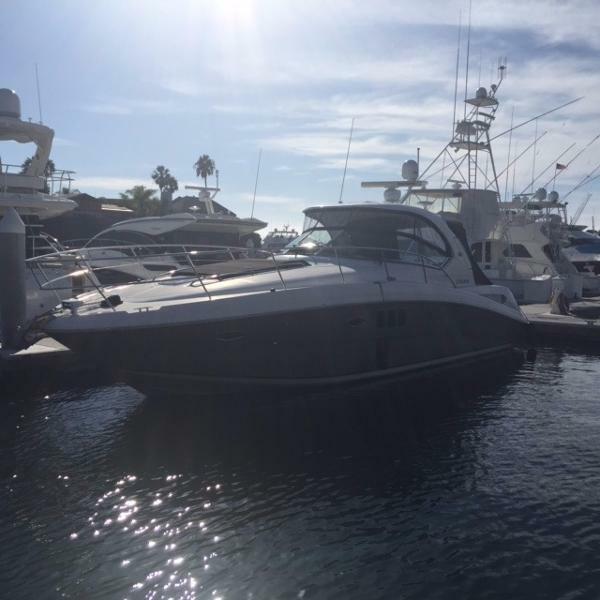 This vessel will provide with not only comfort but incredible amenities and luxury whether youre cruising around town or heading over to the islands for a fun filled weekend, this Sea Ray Sundancer will probably provide you and yours with everything youve ever dreamed of on a vessel. 2007 Sea Ray 38 Sundancer 2007 Sea Ray 38 Sundancer....This exciting 38 Sundancer features a stylish fiberglass hardtop with aft sunshade, overhead lighting and stainless-steel grab rails. An innovative center door in the transom provides easy access to the luxuriously appointed cockpit, complete with Corian table top, wet bar and icemaker. Powered by twin 8.1 S Horizon MerCruiser V-drives, this robust Sport yacht offers underwater exhaust, and standard anchor washdown. This is a one owner, FRESHWATER sport yacht with only 97 hours logged on the inboards and just before listing had oil services completed on motors and generator along with fresh bottom paint completed. 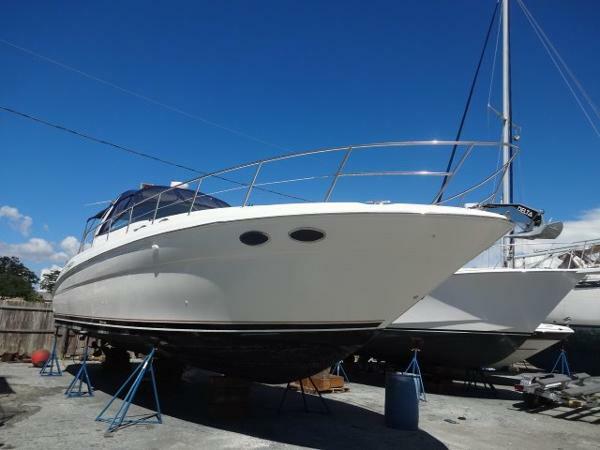 It is nicely equipped with cockpit carpet, cockpit refrigerator, camper canvas, spotlight, windlass, Raymarine electronics, Mercury Vessel View monitor, smart craft gauges, AC/Heat, vacuflush head, pressure water system, central vacuum, carpet runners, and more. Call us today for additional questions. 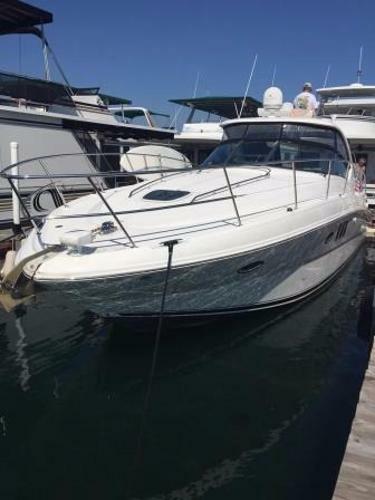 2006 Sea Ray 38 Sundancer Mercruiser 420 HP Freshwater Cooled 8.1 S Horizon HO Engines W/V-Drives & Kohler 7.3kw Generator Vetus Bow Thruster If you are in the market for a 380 Sundancer than look no further. 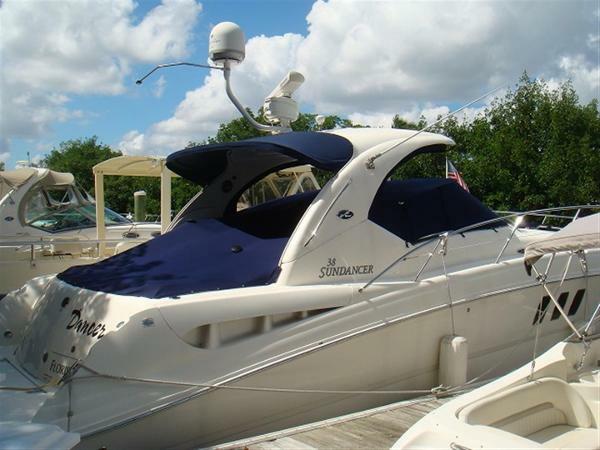 This Sundancer is in immaculate condition, loaded with options, and in truly turn-key condition! Electronics package includes dual Raymarine E120 GPS/plotter/sounder/radar units w/Sirius weather, 72nm Raymarine open-array radar, Ritchie 3" compass, Raymarine Ray 240 VHF, Raymarine ST6002 autopilot, Smartcraft engine monitoring system, Clarion CMD4 marine radio w/helm remote, Clarion DCZ625 6-disc changer, Toshiba DVD player, 2-Sea-King satellite domes, 2-Direct TV receivers, and 4-flatscreen TV's. Call today to schedule a appointment, viewings available seven days a week!! 2001 Sea Ray 38 Sundancer Bristol 2001 Sea Ray 38 Sundancer with Cat 3126TA diesels (340hp) w/ tender. 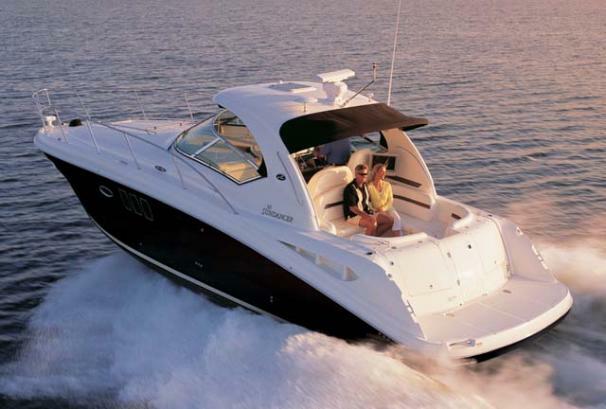 The 38 Sundancer is one of Sea Ray's most popular sport cruisers. She ideal for extended weekend getaways or a short sunset cruise. Factory Options: * Upgraded Cat 3126 diesels * Central Vac. * Windlass * Spot light * Cockpit refrigerator * Head w/ macerator & interlock Owner installed options & upgrades: * 5/16: New Raymarine A127 multifunction 12.1" color display w/ navionics gold chart card * 5/16: New Raymarine A75 7" multifunction display/ slave to A127 * 5/16 New Raymarine ED18D digital radar * 5/16 New Raymarine evolution autopilot * Icom VHF * Back up camera * Fusion stereo w/ 5 subwoofers, WIFI for iphone/android w/ blue tooth * 9/14: New camper canvas w/ U zips front panels * 9/14: New Stainless steel Vitrifrigo Ref/ freezer in galley * Full camper canvas * 7.6 KW diesel gen. (1173 hours) * 2014 Saturn 8.5' inflatable tender w/ 2.5 hp Suzuki 4 stroke She is definite must see to appreciate , even if you are looking at newer 38 Sundancers, you owe it to yourself to see this one before you buy.